Anushka Sharma and Virat Kohli’s reception party was a star studded affair. The party kickstarted well at Lower Parel’s lavish resort. Many cricketers and B-Town celebs graced the event and made it look GRAND. Social media is filled with party pics; it was a pleasure to see so many stars attending it and enjoying to their fullest. Anushka and Virat looked simply the best in their Sabyasachi outfits. We loved the bridal glow on Anushka’s face; of course, how can we miss out on her beautiful red chuda! Forget others, SRK was one such guest who enjoyed himself thoroughly at the event. Well, we know how SRK adds “Chaar Chaand” to whatever event he attends. 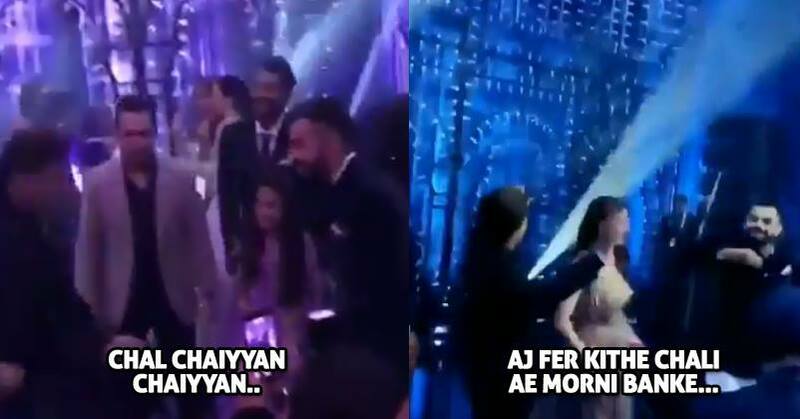 Today, we saw his completely different side as he danced together with Virat and Anushka. The reception was already special, but SRK added some tadka and burned the dance floor. He danced his heart out with the Jodi. Anushka and SRK have worked together in many films and no doubt, their bonding is damn strong. The way they were dancing filled our hearts with joy. This was indeed a treat for all of us. How did you find these videos?